1. AURA AT COLLEGE PARK: Yonge St. and Gerrard St. Builder: Canderel Stoneridge Equity Group Inc. Canada’s tallest condominium at 75 storeys and 931 units. A glass and stone tower with a three-storey glass retail podium. Prices: from $1,038,000 for 1,290 sq. ft. on the 67th floor; penthouses from floors 72-75 from $2,247,600 for 2,335 sq. ft. to $17,500,000 for 11,370 sq. ft. on the 75th floor. Fees: about 33 cents per sq. ft., plus hydro. Amenities: underground connection to the subway, 24-hour concierge, landscaped rooftop garden, recreational and fitness centre. Sales: 98.8 per cent sold. Status: under construction. Occupancy: starting 2012. 2. 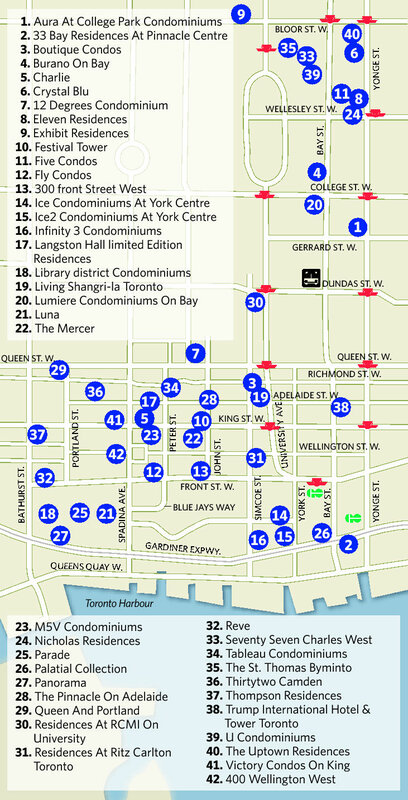 33 BAY RESIDENCES AT PINNACLE CENTRE: Bay St. and Harbour St. Builder: Pinnacle International. A 51-storey tower with 635 units. Prices: from $269,900 for 517 sq. ft. to $619,900 for 1,051 sq. ft. Fees: 53 cents per sq ft., plus hydro. Amenities: two exercise rooms, 70-ft. lap pool, whirlpool, saunas, two theatre rooms, party room, banquet room, business centre, tennis court, putting green. Sales: over 65 per cent sold. Status: under construction. Occupancy: October 2011. 3. BOUTIQUE CONDOS: Simcoe St. and Nelson St. Builder: Urban Capital, Malibu Investments, Alit Canada, West Development. Two buildings, one 15 storeys and one 35 storeys. Prices: from $810,000 for 1,812 sq. ft. to $1,134,000 for 1,861 sq. ft. Fees: 49 cents per sq. ft., plus hydro. Amenities: 24-hour concierge, fitness facility, lap pool, guest suites and rooftop terrace. Sales: two left. Status: Phase 1, built and occupied; Phase 2, built and occupied. Occupancy: Phase 1, immediate; Phase 2, immediate. 4. BURANO ON BAY: 832 Bay St. Builder: Lanterra Developments. A 50-storey glass and steel tower incorporating the Addison on Bay facade. Prices: from the mid-$300,000s for 491 sq. ft. to the mid $700,000s for 1,222 sq. ft. Fees: 53 cents per sq. ft., plus hydro. Amenities: outdoor pool, hot tub, landscaped patio, 24-hour concierge, theatre, party room, Internet lounge, fitness room, steam rooms, guest suite. Sales: a few suites remain. Status: under construction. Occupancy: June 2012. 5. CHARLIE: King St. east of Spadina Ave. Builder: Great Gulf Homes. A 36-storey tower with 314 units. Prices: from $270,900 for 408 sq. ft. to $1,750,990 for 2,032 sq. ft. Fees: 45 cents per sq. ft., plus hydro. Amenities: outdoor pool, poolside lounge, steam room, caterer’s kitchen, dining room, lounge, billiards/media lounge, fitness/weight room, aerobics/yoga studio and 24-hour concierge. Sales: 94 per cent sold. Status: under construction. Occupancy: fall 2011. 6. CRYSTAL BLU: 21 Balmuto St. west of Yonge St. Builder: Bazis Inc. A 35-storey slim glass tower with 136-units. Prices: from $639,900 for 840 sq. ft. to $4,895,000 for a 4,000-sq.-ft. full floor penthouse. Fees: 48 per sq. ft., plus hydro. Sales: three left. Status: built and registered. Occupancy: immediate. 7. 12 DEGREES CONDOMINIUM: Beverley St. north of Queen St. W. Builder: BSAR Group of Companies. An 11-storey condominium of 91 units. Prices: from the $300,000s to over $1 million. Fees: 51 cents per sq. ft., plus hydro. Amenities: rooftop pool, cabana lounge, party room, fitness and yoga studio. Sales: over 60 per cent sold. Status: construction to start spring 2011. Occupancy: summer 2012. 8. ELEVEN RESIDENCES: 11 St. Joseph St. east of Bay St. Builder: Barney River Investments Ltd. An 18-storey building with 206 units with a brick podium (originally a warehouse) with a glass tower. Prices: $310,900 for 619 sq. ft. $657,900 for 1,279 sq. ft. Fees: 45 cents per sq. ft. Amenities: theatre, gym, rooftop terrace, 24-hour concierge. Sales: 90 per cent sold. Status: built and registered. Occupancy: immediate. 9. EXHIBIT RESIDENCES: 200 Bloor St. W. Builder: Bazis Inc., Metropia and Plazacorp. A 32-storey building. Prices: N/A. Fees: N/A. Amenities: N/A. Sales: coming soon. Status: construction not started. Occupancy: N/A. 10. FESTIVAL TOWER: King St. W. and John St. Builder: The King and John Festival Corp. A 46-storey glass tower with 373 units atop TIFF Bell Lightbox. Prices: from $495,900 for 568 sq. ft. to $2.4 million for 2,289 sq. ft. Fees: about 49 cents per sq. ft., plus hydro. Amenities: three-year membership to Tiff Bell Lightbox, 24-hour concierge, resident services director, a-la-carte services such as dog walking, room service and valet parking, cinema with seating for 55 people, indoor swimming pool, whirlpool and floor-to-ceiling waterfall, outdoor terrace, sundeck, sports lounge, spa treatment rooms, meditation garden, yoga, Pilates and dance studio and lounge with Wi-Fi and outdoor terrace. Sales: 98 per cent sold. Status: built. Occupancy: immediate. 11. FIVE CONDOS: 5 St Joseph St. west of Yonge St. Builder: Graywood Developments Ltd. and Mod Developments Inc. A 45-storey, 493-unit modern point tower integrating the historically-designated facade of 5 St Joseph St. Prices: $253,900 for a heritage loft with 451 sq. ft. to $1,201,900 for a penthouse with 1,683 sq. ft. Fees: 50 cents per sq. ft., plus hydro and water. Amenities: piano bar/dining room, billiard room, cocktail lounge with bar and kitchen, TV lounge, party room, men’s and women’s change rooms with wet and dry steam rooms and “experience” showers, cardio and weight studio; roof garden with dining and barbecue area, 24-hour concierge. Sales: 65 per cent sold. Status: construction not started. Occupancy: November 2014. 12. FLY CONDOS: 352 Front St. W. east of Spadina Ave. Builder: Empire Communities. A glass, stone and precast concrete 24-storey building with 465 units. Price: $599,900 for a 1,025 sq. ft. two-storey loft. Fees: 50 cents per sq. ft., plus hydro. Amenities: lounge area, 24-hour concierge, guest suite, rooftop party room with wet bar, chef’s kitchen, rooftop patio with cabanas and barbecue stations, theatre, multi-media studio, exercise room, yoga/Pilates studio, co-ed sauna, juice bar. Sales: one left. Status: under construction. Occupancy: fall 2012. 13. 300 FRONT STREET WEST: Front St. and John St. Builder: Tridel. A 49-storey glass tower with 683 units. Prices: from $323,000 for 490 sq. ft. to $2,430,000 for 2,660 sq. ft. Fees: 39 cents per sq. ft., plus hydro, heating, cooling and hot water. Amenities: sun deck, rooftop infinity pool, cabanas, fountain, barbecue, co-ed massage room, steam rooms, whirlpool, yoga studio, spinning room, fitness studio, billiards room, kitchen, theatre, dining room, poker room, party room and lounge. Sales: 89 per cent sold. Status: under construction. Occupancy: December 2012. 14. ICE CONDOMINIUMS AT YORK CENTRE: York St. and Bremner Blvd. Builders: Lanterra Developments and the Cadillac Fairview Corp. Ltd. A 57-storey Scandinavian-inspired glass-and-metal tower with the largest green roof canopy in Canada with ground-floor retail and a landscaped public square. Prices: from $658,900 for 1,091 sq. ft. to $910,900 for 1,357 sq. ft. Fees: 50 cents per sq. ft., plus hydro. Amenities: indoor pool and hot tub, dry sauna, steam room, cold water plunge pool and relaxing lounge, fitness centre, yoga/aerobics studio, massage room, party room with kitchen facilities, outdoor terrace, business centre, 24-hour concierge, plus 10 bicycles. Sales: 97 per cent sold. Status: under construction. Occupancy: February 2013. 15. ICE2 CONDOMINIUMS AT YORK CENTRE: York St. and Bremner Blvd. Builders: Lanterra Developments and the Cadillac Fairview Corp. Ltd. A 57-storey Scandinavian-inspired glass-and-metal tower with the largest green roof canopy in Canada with ground-floor retail and a landscaped public square. Prices: from $517,900 for 781 sq. ft. to $798,900 for 1,042 sq. ft. Fees: 55 cents per sq. ft., plus hydro. Amenities: indoor pool and hot tub, dry sauna, steam room, cold water plunge pool, relaxing lounge, fitness centre, yoga/aerobics studio, massage room, multi-purpose party room with kitchen facilities, outdoor terrace, business centre, 24-hour concierge, plus 10 bicycles. Sales: 97 per cent sold. Status: construction not started. Occupancy: winter 2014. 16. INFINITY 3 CONDOMINIUMS: Lake Shore Blvd. W. and Lower Simcoe St. Builder: The Conservatory Group. A 35-storey glass and precast concrete building with 407 units. Prices: from low $300,000s. Highest price and square footage undisclosed. Fees: 42.45 cents per sq. ft., plus hydro. Amenities: indoor pool, whirlpool, his/hers change rooms with sauna, massage therapy rooms, cinema, billiards room, table tennis room, exercise room, aerobics room, gymnasium, party room with kitchen, boardroom, library, 24-hour concierge, roof terrace with cabanas and guest suites. Sales: undisclosed. Status: under construction. Occupancy: unknown. 17. LANGSTON HALL LIMITED EDITION RESIDENCES: Adelaide St. W. and Charlotte St. Builder: Langston Hall Dev. Corp. with Hush Homes. A 13-storey modern residence with 30 units. Prices: from $900,000 for 1,124 sq. ft. to $3.5 million for 2,838 sq. ft. Fees: 47 cents per sq. ft., plus hydro. Amenities: library and selected reciprocal privileges with the Templar Hotel. Sales: 70 per cent sold. Status: construction starting fall 2010. Occupancy: winter 2011. 18. LIBRARY DISTRICT CONDOMINIUMS: Front St. and Bathurst St. Builder: Context. A 29-storey glass tower overlooking a new city park and historic Fort York. Prices: from $196,400 for 388 sq. ft. to $465,900 for 826 sq. ft. Fees: 52 cents per sq. ft., plus hydro. Amenities: fitness centre, locker rooms with saunas, stretching room, party room, media lounges, outdoor terraces and guest suites. Sales 70 per cent sold. Status: construction not started. Occupancy: May 2013. 19. LIVING SHANGRI-LA TORONTO: University Ave. and Adelaide St. W. Builder: Westbank Corp. and The Peterson Group. A 66-storey, 370-unit glass curtain wall building. The first 17 floors will be 200 hotel suites and the remaining upper floors will be condo units. Prices (parking included): from $1,017,500 for 859 sq. ft. to $18.888 million for a penthouse with 6,700 sq. ft., plus a 2,900 sq. ft. terrace Fees: floors 18 to 49, 54 cents per sq. ft., plus hydro; floors 50-66, 75 cents per sq. ft., plus hydro (includes limo and valet service). Amenities: two car private garage with private estates, multi-media room, corporate function rooms, banquet room, spa, indoor pool, hot tub, doorman, concierge, fitness centre, yoga studio, steam rooms, business centre, access to hotel services. Sales: about 75 per cent sold. Status: under construction. Occupancy: summer 2012. 20. LUMIERE CONDOMINIUMS ON BAY: Bay St. south of College St. Builder: Menkes Developments and Lifetime Developments. A 32-storey glass tower with 355 units. Price: $890,990 for 1,189 sq. ft. Fees: 43 cents per sq. ft., plus hydro. Amenities: 24-hour concierge, indoor swimming pool with cabanas, sundeck, patio, fitness centre, yoga/meditation room, screening room, event room, games and entertainment room, rooftop terrace with barbecues, guest suites. Sales: one left. Status: built. Occupancy: immediate. 21. LUNA: Spadina Ave. and Fort York Blvd. Builder: Concord Adex Developments. A 38-storey glass tower with an eight-storey podium and an 18-storey building with 700 units in total. Prices: from $359,900 for 745 sq. ft. to $2,212,800 for 3,018 sq. ft. Fees: 45 cent per sq. ft., plus hydro. Amenities: 24-hour concierge, rooftop lap pool, alfresco bar, cabanas, aerobics/yoga studio, steam and sauna, massage and manicure rooms, theatre, fitness centre, guest suites, billiards room and Internet lounge. Sales: 97 per cent sold. Status: built and registered. Occupancy: immediate. 22. THE MERCER: Mercer St. at John St. Builder: Graywood Developments and Beaverhall Homes. A 33-storey, 412-unit glass and brick building with retail space at ground level. Prices: from the mid $200,00s for 363 sq. ft. to over $1 million for over 1,500 sq. ft. Fees: 51 cents per sq. ft. Amenities: media room, kitchen/dining space, fitness centre with spa, lounge and change/shower rooms, party/event room, outdoor terrace with water feature. Sales: 60 per cent sold. Status: construction not started. Occupancy: fall 2014. 23. M5V CONDOMINIUMS: King St. W. east of Spadina Ave. Builder: Lifetime Developments & TAS DesignBuild. A 35-storey, 304-unit glass tower and podium with a curtain wall design. Prices: from $498,900 for 721 sq. ft. to $1,010,900 for 1,450 sq. ft. Fees: 44 cents per sq. ft. plus water, hydro and gas. Amenities: two outdoor terraces with an outdoor fireplace and kitchen, gym and yoga studio, steam rooms, dining room and lounge, guest suite and 24-hour concierge. Sales: 14 left. Status: under construction. Occupancy: June 2011. 24. NICHOLAS RESIDENCES: 75 St. Nicholas St. west of Yonge St. Builder: Urban Capital. A 35-storey tower with 308 units. Prices: $309,900 for 395 sq. ft. to $599,900 for 947 sq. ft. Fees: 47 cents per sq. ft., plus hydro. Amenities: gym, screening room, billiard room, party room and terrace and dining room, cocktail bar, indoor/outdoor lounges with a double-sided fireplace, reflecting pool. Sales: 72 per cent sold. Status: construction starting spring 2011. Occupancy: May 2013. 25. PARADE: Fort York Blvd. east of Spadina Ave. Builder: Concord Adex Developments. Two 38-storey and 43-storey glass towers connected by a bridge and two 18-storey and 21-storey towers with 1,600 units in total. Prices: from $307,800 for 468 sq. ft. to $1,319,800 for 2,068 sq. ft. Fees: 45 cent per sq. ft., plus hydro. Amenities: 24-hour concierge, squash court, spa, yoga studio, pet spa, aerobics/dance studio, lounge, indoor pool, whirlpool, pool-side lounge, steam rooms, party room, fitness area, outdoor terraces, Internet lounge, guest suites, billiard room, cards room, kids play area, arts and crafts area, outdoor pet area and theatre. Sales: Phase 1, 95 per cent sold; Phase 2, 70 per cent sold. Status: Phase 1; under construction; Phase 2, under construction. Occupancy: fall 2012. 26. PALATIAL COLLECTION: SUCCESS TOWER AT PINNACLE CENTRE: Bay St. and Harbour St. Builder: Pinnacle International. A 53-storey tower with 491 units. Prices: from $345,900 for 535 sq. ft. to $1,999,900 for 2,012 sq. ft. Fees: 45 cents per sq. ft., plus hydro. Amenities: concierge, two exercise rooms, lap pool, whirlpool, saunas, theatre, party room, banquet room, business centre, tennis court, putting green. Sales: over 80 per cent sold. Status: built and registered. 27. PANORAMA: Dan Leckie Way and Lake Shore Blvd. W. Builder: Concord Adex Developments. A 28-storey glass tower and a seven-storey podium with 401 units in total. Prices: from $438,800 for 650 sq. ft. to $1,299,800 for 1,525 sq. ft. Fees: 50 cent per sq. ft., plus hydro. Amenities: 24-hour concierge, fitness centre, sauna, rock wall, sports lounge, rooftop hot tub, outdoor terrace, guest suites, billiard room, Internet lounge, bar, games room, outdoor area with barbecue pit. Sales: 97 per cent sold. Status: built and registered. Occupancy: immediate. 28. THE PINNACLE ON ADELAIDE: John St. and Adelaide St. W. Builder: Pinnacle International. A 43-storey building with 564 units. Prices: from $289,900 for 501 sq. ft. to $649,900 for 1,047 sq. ft. Fees: 51 cents per sq. ft., plus hydro. Amenities: exercise room, whirlpool, screening room, rooftop deck, party room and outdoor terrace: Sales: just opened. Status: March 2011. Occupancy: June 2013. 29. QUEEN AND PORTLAND: Queen St. W. and Portland St. Builder: Tribute Communities. A lowrise building built above retail space with 96 units. Prices: from $315,000 for 556 sq. ft. to $720,724 for 1,269 sq. ft. Fees: 49 cents per sq. ft., plus hydro. Amenities: fitness centre, evening concierge, rooftop terrace with landscaping, water feature and barbecue area. Sales: nine left. Status: under construction. Occupancy: summer 2011. 30. RESIDENCES AT RCMI ON UNIVERSITY: 426 University Ave. south of Dundas St. Builder: Tribute Communities. A 42-storey, 318-unit building. Prices: from $335,990 for 504 sq. ft. to $563,990 for 763 sq. ft. Fees: 48 cents per sq. ft., plus hydro. Amenities: fitness room, access to dining facilities in RCMI, bicycle storage, 24-hour concierge. Sales: 85 per cent sold. Status: under construction. Occupancy: November 2012. 31. RESIDENCES AT RITZ CARLTON TORONTO: 183 Wellington St. W., west of Simcoe St. Builder: Graywood Development and Cadillac Fairview. A 52-storey, 159-unit glass building. Lower floors will be hotel suites. Residential units start at the 22nd floor. Prices (parking and locker included): from $1.6 million for 1,512 sq. ft. to over $9 million for over 6,000 sq. ft. Fees: 79 cents per sq. ft. Amenities: 23,000-sq. ft. spa with indoor pool, exercise facilities, steam rooms, saunas and whirlpool, 24-hour concierge, valet parking, guest suite, games room, theatre room and doorman. Residents will have access to hotel amenities including room service and maid service and access to the PATH system. Sales: about 80 per cent sold. Status: built. Occupancy: 60 to 90 days. 32. RÊVE: Front St. W. east of Bathurst St. Builder: Tridel. A 13-storey building with 305 units. Prices: from $334,000 for 645 sq. ft. to $850,000 for 1,455 sq. ft. Fees: 53 per sq. ft., plus hydro, heating, cooling and hot water. Amenities: party lounge, meeting room, billiard room, theatre, yoga centre, sauna area, wellness centre and rooftop terrace. Sales: 89 per cent sold. Status: under construction. Occupancy: July 2011. 33. SEVENTY SEVEN CHARLES WEST: Charles St. and St. Thomas St. Builder: Aspen Ridge Homes. A 16-storey building with 56 units. Prices: from $1,414,990. Higher price and square footage undisclosed. Fees: 82 cents per sq. ft., plus hydro. Amenities: 24-hour valet parking and concierge, personal training room, boardroom. Sales: undisclosed. Status: under construction. Occupancy: spring 2012. 34. TABLEAU CONDOMINIUMS: 117 Peter St. at Richmond St. W. Builder: Urban Capital, Malibu Investments, Alit Canada. A 36-storey building. Prices: from $249,900 for 405 sq. ft. to an unknown price for 1,036 sq. ft. Fees: 51 cents per sq. ft., plus hydro. Amenities: 24-hour concierge, fitness centre, steam room, screening room, games room, guest suite. Sales: just opened. Status: construction not started. Occupancy: June 2014. 35. THE ST. THOMAS: St. Thomas St. and Charles St. Builder: Minto Urban Communities Inc. A 23-storey tower anchored by a contemporary black granite podium with 48 units. Prices: starting from $1.6 million for 1,300 sq. ft. to over $8 million for over 6,000 sq. ft. Fees: 98 cents per sq. ft. Amenities: 24-hour concierge, doorman, valet parking, hall porter, party room with catering kitchen, wine lounge, private dining/conference room, reading lounge, indoor swimming pool, his and hers change rooms and showers, outdoor sun terrace, fitness studios and guest suites. Sales: just opened. Status: construction not started. Occupancy: fall 2013. 36. THIRTYTWO CAMDEN: 32 Camden St. and Spadina Ave. Builder: Sorbara Development Group. A 12-storey boutique building with 87 units. Prices: N/A; square footage between 375 sq. ft .and 1,400 sq. ft. Fees: 52 cents per sq. ft. Amenities: fitness room and outdoor terrace. Sales: start March 2011: Status: construction to start summer 2011. Occupancy: December 2012. 37. THOMPSON RESIDENCES: 621 King St. W. east of Bathurst St. Builder: Freed Developments. Two 12-storey towers with 314 units in each building. Prices: $279,900 for 350 sq. ft. to $2 million for 2,600 sq. ft. Fees: about 52 cents per sq. ft., plus hydro. Amenities: hotel services can be used on a “pay-per-use” basis including housekeeping service, laundry and dry cleaning service, catered dining/events, valet parking, business/residences lounge, rooftop pool. Sales: 70 per cent sold. Status: construction not started. Occupancy: winter 2013 to spring 2014. 38. TRUMP INTERNATIONAL HOTEL & TOWER: 325 Bay St. at Adelaide St. W. Builder: Talon International Development Inc. A 60-storey glass and stone tower with 118 residential units and 261 hotel units. Prices: residential from $2.1 million for 1,310 sq. ft. to $19.6 million for a three-level 7,799 sq. ft. penthouse. Hotel suites (fully furnished) from $900,000 for 587 sq. ft. to $6.9 million for 4,014 sq. ft. Fees: 82 cents per sq. ft. Amenities: spa, fitness area, lap pool, business centre with meeting rooms, boardrooms and catering service, 24-hour concierge, valet parking and all of the hotel amenities. Sales: 78 per cent sold. Status: under construction. Occupancy: begins summer 2011. 39. U CONDOMINIUMS: Bay St. south of Bloor St. Builder: Pemberton Group. A 45-storey glass tower with 429 units and a 55-storey tower with 537 units. Prices: from the mid-$300,000s for 512 sq. ft. to over $1 million for 1,477 sq .ft. Amenities: party room, library, exercise room, yoga studio and 24-hour concierge. Sales: undisclosed. Status: under construction. Occupancy: Phase I, summer 2012; Phase II, summer 2013. 40. THE UPTOWN RESIDENCES: 35 Balmuto St. south of Bloor St. Pemberton Group. A 48-storey precast concrete, granite and glass building with 284 units. Prices: from $947,900 to $2,142,900 for 1,270 sq. ft. to 2,110 sq. ft. Amenities: lounge with outdoor terrace, cardio/fitness gym, steam rooms, media/lounge, 24-hour concierge, virtual golf, theatre. Sales: undisclosed. Status: under construction. Occupancy: fall 2011. 41. VICTORY CONDOS ON KING: King St. W. west of Spadina Ave. Builder: BLVD Developments. A modern 12-storey steel, brick and glass building with oversized balconies and terraces. Prices: from the low $700,000s for 800 sq. ft. to $2,219,000 for 2,545 sq. ft. Fees: 49 cents per sq. ft., plus hydro. Amenities: concierge/security service, screening room, ounge/bar, boardroom, dining room with kitchen, fitness studio and guest suite. Sales: 96 per cent sold, only four penthouses left. Status: under construction. Occupancy: winter 2011. 42. 400 WELLINGTON WEST: Wellington St. west of Spadina Ave. Builder: Sorbara Development Group. A 12-storey, 102-unit building with a window and masonry exterior. Prices: from $409,990 for 811 sq. ft. to $944,990 for 1,529 sq. ft. Fees: 50 cents per sq. ft., plus hydro. Amenities: party room and concierge. Sales: 75 per cent sold. Status: under construction. Occupancy: December 2011.